In the virtual world, any thing is possible. The laws of physics are suspended. So are the the laws of beliveability. In my virtual world, not to be confused with yours, things may pop into my head, from suggestion i may get subliminally from routine sources. Like the news. Something someone in your family might have said. Having a double entendre suddenly dawn on you. 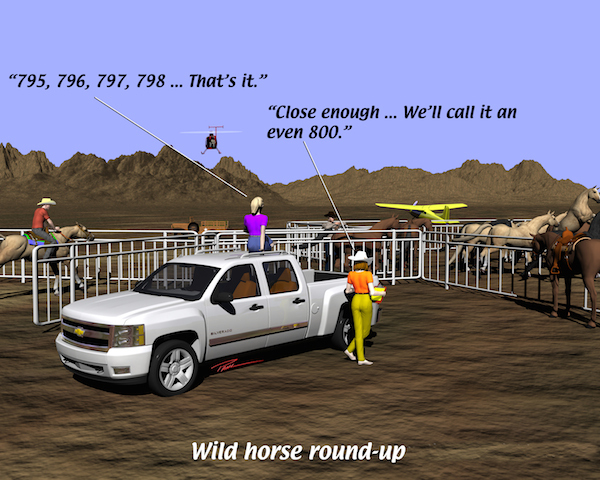 I cite the following toon, Wild Horse Round-up. Who, actually is this aimed at? The BLM in Nevada? They have a round-up every year. It’s quite controversial with conservationists and organizations like PETA. The Horsey Set? Cowboys? Cowgirls? Chevrolet? Or could this toon really be a “really rotten” play on words? What do you think? Weather has been in the headline news for many months. 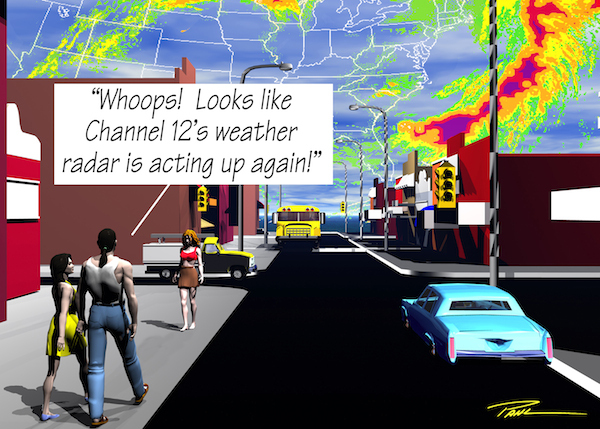 Twisters, huge rainfall weather patterns, etc. Attractive women in V studios, with huge flat-screens behind them, doing a show and tell with various weather maps and imagery. Being weather people, we’ll often find them standing ankle or knee deep in flood waters. Freezing their butts off. A pair of behind-the-scene people are probably with them, but since they’re not onscreen, they’re probably under a shelter of some kind.. Doesn’t anyone realize there are critters under that water? Fish from flooded rivers and streams, snakes like water moccasins and copperheads even rattlers are out swimming, exploring the surface, maybe looking for something dry to crawl out on. Like umbrella-toting weather-girls. Snap turtles might be looking hungrily at the human tiny feet wearing worthless boots that look good in the fashion world, but nothing more than a meat-wrapper to a 50 pound self-propelled amputater [word?]. Alligators, cruising just under the surface, looking for tasty weather girls.. But I digress. What about storm chasers? Those seemingly stupid people who run towards storms, hoping for a tornado to photograph? A nasty, destructive tornado? Awhile ago, a dramatic shot of a black twister could bring the image-maker big bucks, and now that the top SLR (single lens reflex )digital cameras also make videos with huge resolution, storm photographers can make super videos. I content they’re completely nuts to even go out in that weather, especially in a tiny moving steel box that Mother Nature seems not to recognize as a safe, but movable, haven. Nowadays there are so many quality camera rigs out there, not to mention the very acceptable videos from smart phones, so the market is saturated. Some TV outlets won’t even consider buying footage from the public, unless it is spectacular, and then what they pay won’t begin to cover your expenses. Storm chasing is not a great way to make a living. Howsomeever, the whole practice evoked this cartoon. In my virtual world I can do anything, build anything… With the use of Bryce 3D (available on daz3d.com) The programs come with “Primatives, which are simple cubes, circles, rounds, flat shapes and lights. With these you can construct just about anything, from a simple boat dock to a skyscraper. 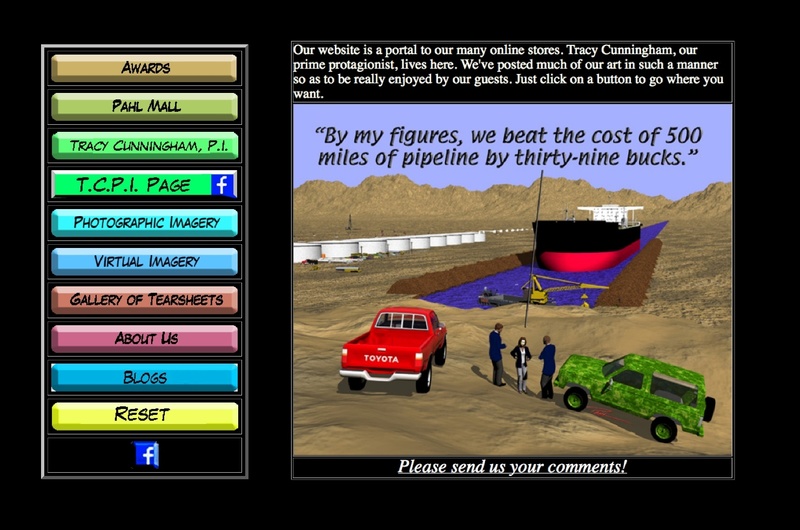 Or, I can buy or download freebies of digital models of various things like autos, planes and water-craft. I can pose digital models of people in any stage of undress or dress. If I want my model to be wearing something different, I can go to the web and purchase clothing and accessories for a whole lot less than what the real world charges. When I am done, I transfer the posed beings into Bryce, where I put them into a scene I have made. From that point I can move my point of view (POV) any place one can imagine. I have done some testing and research into making one of my books into a graphic novel. Daz Studio and Bryce 3D and Photoshop would be central to the effort. Imagine. Unfortunately, Bryce 3D is a program that is slowly obsoleting itself. There have been no new versions or updates for several years. It does not work on the later Mac OS Programs. Nothing past OS 10.6.8(?) It probably won’t be long before the new Windows OS will no longer handle it. That (And Adobe’s GoLive) are the two reasons that I have kept and maintain my old mini mac, which uses MAC OS 10.411. I have a large, but relatively inexpensive, HP monitor that supports two inputs from two different computers. All I have to do is hit a video input switch, unplug and replug into the “new” computer, the USB connector with both my mouse and keyboard attached, (both wireless) and I’m right back in biz. Whoops, my groceries are being delivered.